Let me just thank everyone who encouraged me to stay on the straight and narrow path to healthy living. Wait, none of you did that. You just want more evil and delicious ways to use my juicer. Bless you hearts. 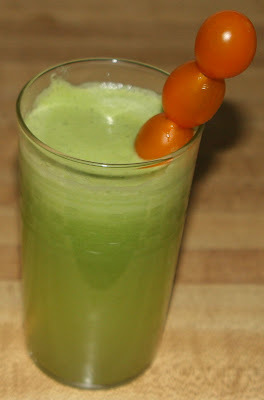 Here is the recipe for the Greeny Lucinda. Since that tired old Bloody Mary is garnished with celery, we thought it only fitting and proper to garnish our Greeny Lucinda with tomatoes. Juice the celery, apples and spinach. Pour into a glass. 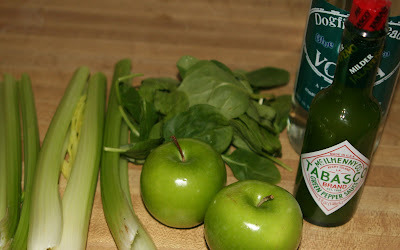 Add the bitters and Tabasco. Garnish.